Sometimes, it's nice to be home. In the past two months, I've been to Michigan four times, St. Louis for a weekend, Mexico and back again, one wedding, two wedding showers, and a graduation party. I've rushed home from work on Friday nights to pack up the car, say good-bye to the cat, and live out of a duffel bag for the weekend. I've come back to empty fridges and no time for grocery shopping. And trust me, I'm not complaining. This is what I love about summer. With all the coming and going, staying still becomes almost a treat. You know what else is a treat? 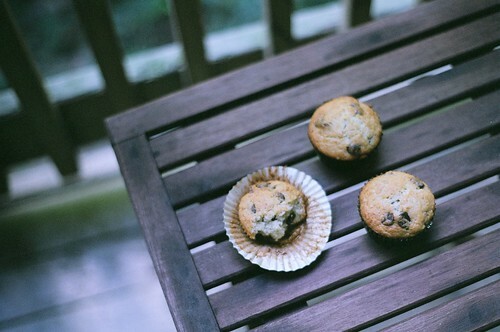 Banana chocolate chip muffins. I made these last Saturday morning -- the first Saturday in a long time that I actually woke up in my own bed and got to putter around the apartment, cooking, cleaning and taking pictures with no real hurry or schedule. 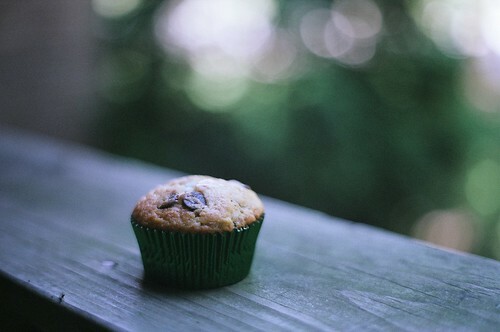 I had been staring at this muffin recipe all week, which is something I often do when preparing to make something new. I find the recipe and bookmark it, then revisit it a few times a day to read over the ingredients and the process, to make sure I really want to make this and if I even can, to mentally side aside some time to take it slowly. I think a quiet Saturday morning is the best time to make muffins. My favorite part of these muffins are the chocolate chips. 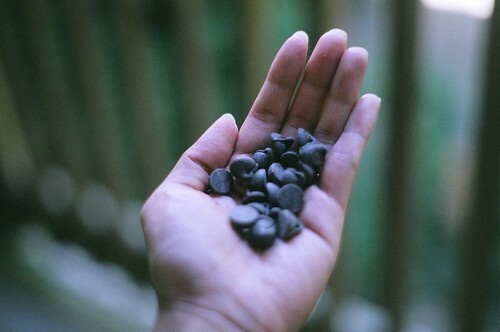 I love chocolate chips. I think every dessert should be dotted with chocolate chips. And I'll be completely honest with you: As I mixed the chips into the batter, I got pretty excited. Here I am, baking! With chocolate chips! From scratch! What a great way to start a Saturday. Alas, this story of a Saturday ends in destruction. 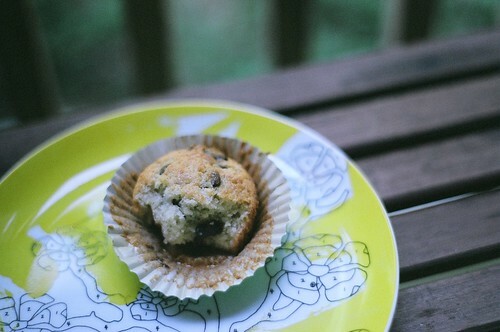 The muffins turned out beautifully -- moist and banana-ey, with bits of melted chocolate chips throughout. And oh-so-easy. Unfortunately, I only got to eat one. I gave away half and left the rest in a bag on the counter, then spent the rest of my Saturday out and about. I came home to a bag of muffin crumbs on the floor. It completely slipped my mind that our cat, Tim, hunts bread products. His favorite food is Hawaiian sweet bread. He's attacked and demolished cinnamon rolls and Subway sandwiches. He is known to catch loaves of bread and howl in the middle of the night, waking us up to observe his prey, which he has hoarded in the closet. He got to the muffins. And though he didn't eat them, he made sure no one else could. That Tim. I forgave him, of course. And it's a good thing I won't be leaving town again for a while, not only because it's nice to be home, but also because I have this beast to keep my eye on. Besides, there's more baking to do. I deserve another banana chocolate chip muffin. Preheat oven to 350°F. Line twelve 1/3-cup muffin cups with foil muffin liners. Mix flour, sugar, baking powder and salt in large bowl. Mix mashed bananas, egg, melted butter and milk in medium bowl. Stir banana mixture into dry ingredients just until blended (do not overmix). Stir in chocolate chips. Divide batter among prepared muffin cups, filling each about 3/4 full. Bake muffins until tops are pale golden and tester inserted into center comes out with some melted chocolate attached but no crumbs, about 32 minutes. Transfer muffins to rack; cool. Store far away from cats. HA! Oh, Tim. At least you still got one, and maybe this is his way of saying you should bake more! They looked delicious! ha, Tim, the carb addict. How funny! I agree, early quiet Saturday mornings are my time to bake, too. char - chocolate chips make everything yummy! shanna - yeah, i'll definitely be making these again very soon. i actually had all of the ingredients on hand! can you believe it? nicole - carb addict! hilarious. yes, once my weekends start to slow down (like, after the wedding! ), i'd like to spend more saturday mornings learning how to bake.